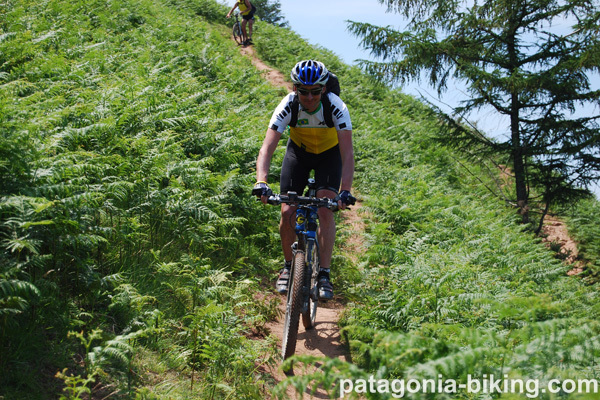 it is a real MTB itinerary (the longest and toughest in the Iberian Peninsula), only for those able to take part in the geographical and climatic challenge of a great adventure. We will go across the Pyrenees lengthwise on the south side, from the Mediterranean to the Cantabrian Sea (Atlantic Ocean). We will ride through several ups and downs, countless valleys and add a level difference that doubles the Himalayan trip crossing (Kathmandu-Lhasa)! This route has many attractive spots: it goes through the most representative national parks and mountain passes in the Catalan, Aragonese and Navarrese Pyrenees. We will enjoy old chapels and churches from Roman times, medieval towns, ghost towns and some megalithic ruins from the Iron Age. On this trip you will forget you are in Europe and you will completely enjoy nature and mountains in their most pure state. Mountain folklore and legends to be discovered. Places: Villamaniscle, Rabos de Emporda, Espolla, Agullana, Darnius. We go through Sierra de Albera. We will see vineyards, farmland and pine woods. Albera National Park. Boadella Lake. We end the stage at the Muga river green valley. Places: Garrotxa region. Deep forest, we will ascend to two passes. 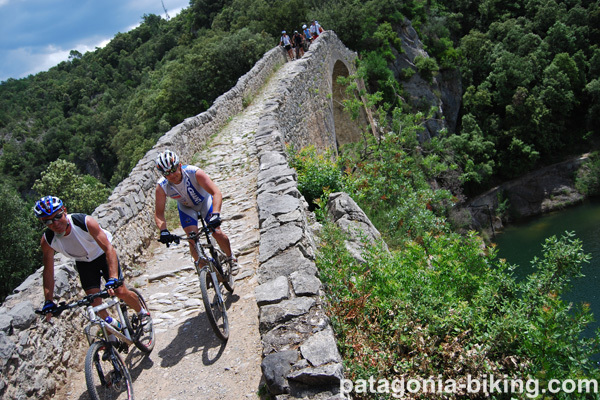 Then we will ride along the Saint Aniol river, by some spectacular cliffs. 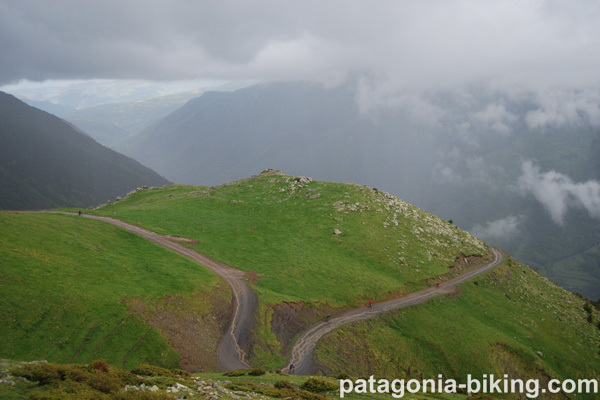 Places: We will ride up to Collet de la Gralla (2060), over the Sierra de Cavallera. From there, we will go down the Ribes de Fraser Valley (910), to go up again to Vilamanya, Barraques (1659), ending the stage with a descent to Planoles (1130). Places: a long ascent from Toses to Cap de Costa Rasa. From there , and next to the Sacred Mountain, to the de la Molina ski area we go up again to the Coll de Pal (2110). We finish with a long descent to Baga. Cadi Natural Park. MTB ride, some technical stretches. Places: Col de la Bena and Col de Thor, in Cadi Natural Park. Spectacular views. Descent to Tuixen valley, Barcelonesa and Coll de Arnat. Places: Noves de Segre, Coll de San Joan de Erm. We go across the largest conservation forest in Urgell. 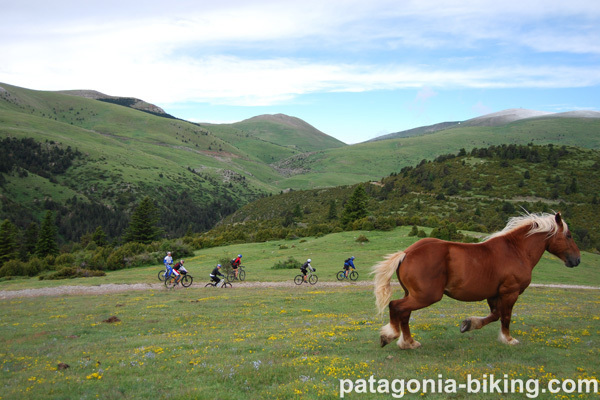 Places: we go up the plateau of the Alto Pirineo Natural Park, riding through hills such as the Collado dela Portella (2250). We go down to Vall Fosca, getting past Espui. In order to get to the Coll de Oli, we will have to carry the bike for a stretch. The trip continues across: Guiro, Sentis, Sas and Erta -deserted villages-. Malpas and Gotarta. Pont de Suert is a large village with all the amenities. Places: Coll de la Espina, near the Benasque national Reserve, Garganta of the river Esera, Seira, Senz, Viu. Places: the first stretch is on a collapsed road, sometimes we will have to carry our bikes. Then we continue through a thick forest. We will then see the Ordessa and Monte Perdido National Park. River Anisco spectacular gorge. Places: Broto, Vinamala National Reserve, Bisecas, Senegue, Pueyo de Escues Collado, Garcipollera Reserve, Castiello de Jaca, Aisa. This is the most difficult stretch in the trip, we will ride through 3 valleys and several passes, some of the roads are in bad shape. 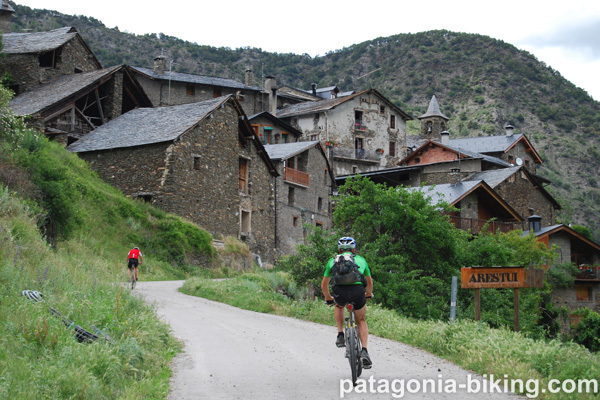 Places: we will ride through 2 well known Aragon villages: Hecho and Anso. Through the Ossa Forest and Beral River Gorge. Visaurin Valleys National Reserves. Roncal and Isaba Valley. Places: de Laza Pass, Irati Forest, Roncesvalles (Orreaga), mythical spot part of the Camino de Compostela. 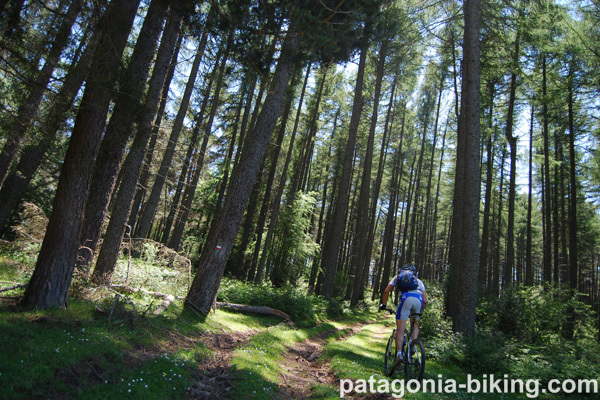 We descend 20 km from the Lindux Collado through thick forest in the French Pyrenees to Banca. We go up the steep Elorrieta Collado, where we can find megalithic ruins and ferns everywhere. A stretch on trails and a descent to Erratzu. Places: different villages in Spain and France. We will ride through Elizondo, Elbetea and Etxalar, where there are houses and towers belonging to the aristocracy of the 15th to 18 centuries. Bagordi. Senorio de Bertiz Natural Park. Lizarreta Collado –famous for its pigeon hunting-. From the restaurant “Venta Yasola” we will descend through a fern forest to Venta Zahar. We ride by the Orreaga Lake and from there we ascend to Poiriers Collado (France).We ride through thick forest and make the last, exciting, descent. We go through Irun –the only city in the itinerary- and on to Hondarribia. 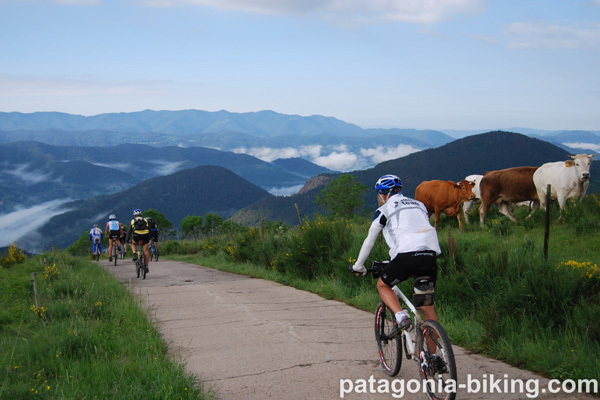 The trip is done mostly on dirt roads that go through villages in the Catalan, Aragonese and Navarre’s Pyrenees. These three areas are elevated by each other’s differences, regarding scenery and also social wise. We go through some of the most important national parks and mountain passes. We will visit Albanya, Compodron, Planoles, Baga, Noves de Segre, Llavorsi, Espiu, El Pont de Suert, Senz, Sarvise, Senegue, Aragues, Isaba, Orreaga, Etxalar and Hondarribia among others. The itinerary was designed mostly by Jordi Laparra, who wrote a very good guide used for the Transpirenaica. Here you can see the tour. 980 km (about 65 % is dirt road). medium-high This is a demanding trip, only for experienced mountain cyclotourists. They need to know how to cope with climatic changes and dirt roads. We will have plenty of sunlight, so there will be no hurry. We will make stops in order to rest and regroup. Daily riding will be about 75 km in about 7 or 9 hours including breaks. 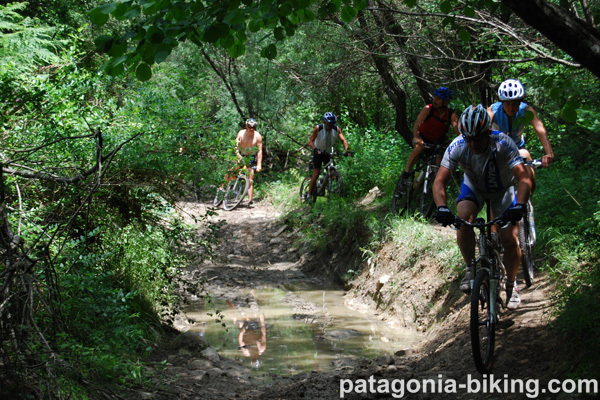 Over 65 % is dirt road, where it is easy to get lost and essential to be in groups. 98 % of the roads have bike lanes and we will need to carry our bikes only in short sections. Sometimes the support vehicle will not be able to come with us (because of road conditions) and will carry equipment and those who need to be carried, to the hotel or the place where the stage finishes. Each rider will receive a small package with lunch and a sweet snack. Each of you must carry a small bag or backpack with spare clothes -in case there is a storm-and a basic repair kit for the MTB bicycle. Most of the itinerary is near the mountaintops at the boundary lines, but the guide can decide to change the itinerary if he sees fit and choose an easier option. Level difference: 23000 m. Maximum altitude in this trip is reached at the Coll de la Portella, at 2250 m. Average daily level difference (up) is 1800 m. There are about 45 ascents that go from 3 to 30 km long each in this trip. The ascents are longer in Catalunya, with a slope of about 8 %. There are some few short ascents with a slope of up to 20 % in Navarra. it can be over 30 degrees at the lowest stretches. Mountain weather means that altitude brings lower temperature and also the possibility of storms. There can be sudden climate changes in this trip.